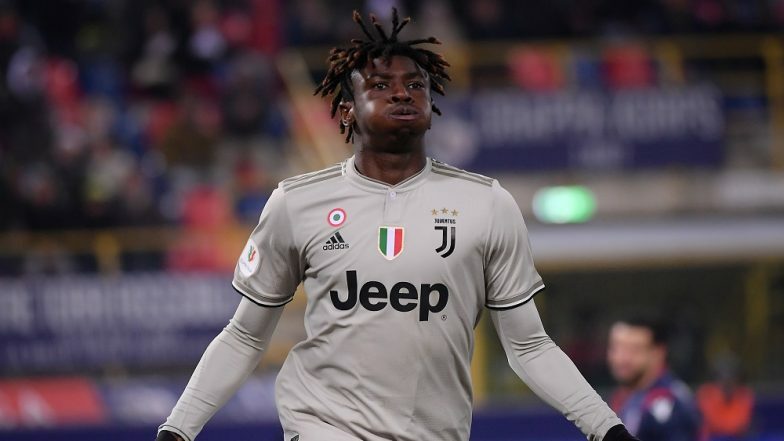 Turin, Italy, April 7: Budding star Moise Kean scored the winning goal with six minutes left in regulation to lead Juventus 2-1 over AC Milan, a victory that moves the hosts closer to an eighth consecutive Serie A title. The 19-year-old extended his scoring streak to the fifth match and assured the Bianconeri of taking all 3 points from the contest at Turin's Allianz Stadium on Saturday night, reports Efe news. Juve, with 84 points from 31 matches, is set to clinch their 35th Serie A championship on Sunday. Cristiano Ronaldo Scores a Hat-Trick Against Atletico Madrid; Celebrates Juventus’ Mimicking Diego Simeone’s ‘Cojones’ Gesture (Watch Video). For AC Milan, the loss means their grip on fourth place -- the final Champions League berth -- is in jeopardy. Atalanta are just a point behind the Rossoneri and have a game in hand, while sixth-placed AS Roma trail by two points after winning 1-0 Saturday away to Sampdoria.